RUSH: Well, I’m thinking right about now the Drive-By Media is once again depressed and angry, combination of the two. Because every day they get up, as you know, and they think they’re gonna find the silver bullet that’s gonna send Trump packing that day, not six months from now. They think they’re gonna wind up with something that’s gonna send Trump packing, resigning, being frog-marched out of the White House, whatever, that day. And yet every day they look at Trump, and they see a guy having fun, they see a guy enjoying the job, they see a guy enjoying his life, and they see everybody around Trump laughing and joking and having a great time, and it’s just gotta dispirit them. Greetings, folks. How are you? Happy to have you here. Rush Limbaugh. 800-282-2882 if you want to be on the program. You know how you get dispirited when it seems like the left is triumphing and winning and the media gets away with what they get away with? They go through the same stuff. Do not doubt me. I’m telling you that it just happened. Trump convened a cabinet meeting moments ago just before the broadcast began, and he ended the media coverage of the cabinet meeting right as this program’s theme music was beginning. It was an awesome coordination that we put together there. So the president kicked the media out and began the cabinet meeting right as this program was beginning. The media was in there probably 10 minutes. And Trump is just lapping it up and yukking it up and he’s congratulating Gary Cohn, the economic adviser who’s resigned. And everybody’s congratulating Cohn and shaking his hand, and Trump is complimenting him. And Cohn is just beaming sitting back there. He’s not at the cabinet table because his position’s not cabinet level, but he’s sitting right behind Trump, just over Trump’s right shoulder. He’s beaming ’cause everybody’s praising the job that he did on the tax cuts, on the corporate rate side. There was no indication that the guy’s mad. There was no indication that Cohn’s refusing to be happy, refusing to play ball. You see a bunch of people, Trump and his cabinet, genuinely happy, genuinely in a good mood with genuine good spirits, and they were enjoying being there, and they were enjoying doing what they were doing. And then Trump went around and talked about various people. He talked about the tariffs. And he talked about all of the private sector investment that is taking over jobs the government used to do and how they’re doing it much better and how they’re doing it much cheaper and how much he admires it. And the one thing he cited was rockets and space. He said he loves these rich guys launching their rockets. He said it’s more amazing to watch these rich guys be able to land their rockets back down on the launch pad and use them again. He said it’s almost as exciting to see the rockets come down like they used to in the old science fiction movies instead of perishing in the atmosphere during reentry. He said it’s amazing, these rich guys are launching their rockets, we got rockets going up everywhere. And you know how much it costs? He gave a figure of what it costs for an average rich guy rocket launch and he said the government couldn’t come close to this. The government couldn’t launch a single rocket for what these guys are doing launching five or six. These rich guys and their rockets, you gotta love it. And I’m just sitting here marveling at this. Because Trump, whether he knows it or not, he’s just jamming it right back down the media’s throat with these televised sessions, I don’t care what they are, cabinet meetings or health care meetings or immigration meetings or what have you. Trump’s not talking to portraits. The only person we know of that ever tried to talk to a portrait was Hillary, and she came out and told everybody she was actually talking to Eleanor Roosevelt. Everybody thought, “Well, that’s normal.” And then Hillary told us what Eleanor Roosevelt told her. And of course it was all about feminism and Undeniable Truth of Life number 24 and all this other stuff. Trump’s not talking to the portraits. He’s not wandering the halls aimlessly. He’s getting his agenda passed. He’s getting his agenda done. And he says (imitating Trump), “These tax cuts, these tax cuts are better than anybody thought. These may be the best tax cuts in the history of tax cuts. These tax cuts, Gary was talking about, Gary can’t believe how successful. It’s very bad for the Democrats, folks, it’s very, very bad for the Democrats. These tax cuts are worse for the Democrats than you can believe.” And the table starts laughing and yukking it up, including Cohn, who’s a Democrat. RUSH: We got audio sound bites from Trump. I mentioned that he let the media in prior to the cabinet meeting getting underway and that it was a raucous good time, and I’ve got the audio sound bites here as some evidence. I told you about Gary Cohn and Trump was laughing it up with Cohn and everybody in there having a great time. But what this bite does, if you’re really wondering why did Trump get rid of Cohn, and the Drive-Bys have their theory. 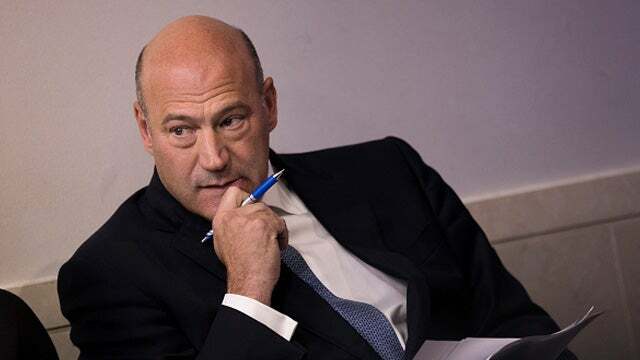 “Well, Cohn quit because he hates Trump, because he knows Trump’s a white supremacist and he doesn’t agree with Trump on tariffs. He knows that Trump’s an idiot and he’s lost his ability to influence Trump. So he’s throwing his hands up in abject frustration saying, ‘I can’t control this lunatic anymore so I’m leaving. '” That’s the Drive-By explanation for why Gary Cohn’s leaving. Here’s Donald Trump talking about it. THE PRESIDENT: This is Gary Cohn’s last meeting in the cabinet, and he’s been terrific. He may be a globalist, but I still like him. (laughter) He is seriously a globalist. There’s no question. But, you know what, in his own way he’s a nationalist because he loves our country. (applause) You love our country. THE PRESIDENT: He’s gonna go out and make another couple of hundred million and then — (laughter) — then he’s gonna maybe come back. THE PRESIDENT: We’ll be here another seven years hopefully and I have a feeling you’ll be back. I don’t know if I can put him in the same position. He’s not quite as strong on those tariffs. RUSH: You heard the answer why Gary Cohn’s gone right there in that bite, what do you think it is? What do you think it is? What’s the answer? He’s a globalist. He’s a globalist. Trump made the point at least two different times. “He’s been terrific, he may be a globalist, but I still like him. He is seriously a globalist. There’s no question. But, you know, in a way he’s also a nationalist. But he’s a globalist.” Had to go. Tariffs, last straw, had to go. Not compatible with what Trump wants to do. But, you note Trump didn’t throw him overboard here. Speaking of Trump serving another seven years, there is polling data today that is not only not good at all for the Democrats in the midterms, it is excellent for Trump in his reelection bid for 2020. Now, I know, I’m the one that says that polls this far out don’t mean anything — and to me, that’s true. But to the left and the Drive-Bys who live and die by ’em, I’ll take a poll that’s advantageous for Trump 2-1/2 years out, fine and dandy. If it ticks them off, if it upsets them, I’ll take it. Here, by the way, is Trump and NAFTA and so forth. By the way, this is a prediction I made either yesterday or the day before that I thought what this tariff business really was all about was trying to force favorable terms, renegotiation with Mexico and Canada. Here’s Trump a little bit on that. THE PRESIDENT: We’re negotiating with Mexico, we’re negotiating with Canada, the NAFTA — and depending on whether or not we reach a deal, also very much involved with that is national defense. But if we reach a deal, it’s most likely that we won’t be charging those two countries the tariffs. RUSH: Bingo! Did I not predict this? It was yesterday or the day before. I think it was yesterday. This was… To people that know Trump, have read The Art of the Deal, and are conversant in Trumpism, this was not hard to predict. And there he is confirming it. “[I]f we reach a deal, it’s most likely that we won’t be charging those two countries the tariffs.” By the way, I have another theory and explanation for why there are tariffs be imposed in the first place, and it constitutes Trump being a couple of moves ahead of people on the chessboard. We have more sound bites from the pre-cabinet meeting coming up after this. RUSH: Welcome back. Rush Limbaugh. In all four corners of the world, I and this program are a household name. Here’s Trump talking about rockets and the rich guys that fire ’em and how much he likes it. THE PRESIDENT: NASA’s making tremendous strides, and we’re using a lot of private money. A lot of people that love… They love rockets, and they’re rich. So they’re gonna be a little less rich probably, but a lot of rockets are going up, and we’re really at the forefront. Nobody’s doing what we’re doing. I don’t know if you saw last with Elon with the rocket boosters where they’re coming back down. To me, that was more amazing than watching the rocket go up, ’cause I’ve never seen that before. Nobody’s seen that before, where they’re saving the boosters and they came back. Without wings, without anything, they landed so beautifully. See, here’s the thing. Trump is getting government out of all these things, and the private sector picks up the slack, does it, does it well, and much more efficiently and much more cheaply — much more cheaply, by definition. It always happens, and Trump is the impetus behind this and he’s simply calling out the success of it. It is fascinating to watch Elon Musk’s booster land back down on the launch pad or on a ship at sea. They have enough fuel… After boosting the payload into orbit, they have enough fuel to plummet for miles in the atmosphere and land (snorts) in the same position they were at takeoff! You’ve never seen this except in old science fiction movies, and it’s been working almost routinely well. It is kind of great to see. Here’s Trump praising Florida for passing concealed-carry for teachers. This is an interesting subject. It’s a bill in the Florida legislature that some people think Governor Scott should veto but that he won’t because everybody in Florida’s clamoring to “Do something! We have to do something!” So there’s a four-pronged bill here, and one of the prongs in the bill allows concealed carry for teachers. That’s the primary reason opponents want Scott, the governor, to veto it. But they don’t think he will because he’s running for the Senate against Bill Nelson in November, and after the shooting at the high school, the first piece of work come out of the legislature veto it? That’s just… Even if it’s the right thing to do — it probably is the right thing to do — to veto it may be politically suicidal, given the fever pitch emotions. But here’s Trump talking about one part of it. THE PRESIDENT: I want to congratulate the state of Florida and your representatives on some very good legislation that’s been passed. I guess they’ve been listening to me a lot more because unexpectedly, they passed concealed-carry for some very special teachers that have a great ability with weapons and with guns. And they passed that. It was somewhat surprisingly to people because they didn’t go in thinking about that, but I guess they liked what I said. And a certain group of people have great talent. They’re in the school, they love their students. It’s concealed, and I think it brings great safety. RUSH: Okay. Now, there are three other elements of this piece of legislation, of which I will inform you in the next hour. But there is the concealed-carry element to this. And it’s got a lot of people fit to be tied, as you can imagine. But it’s kind of a Catch-22, because we’re here in south Florida, “Do something! Gotta do something!” So they’ve produced a bill that’s got this thing in it that the do-something crowd doesn’t like. And if the governor vetoes it, he’s gonna be in heap big doo-doo, politically, he thinks. Finally, here’s Trump on the sanctuary cities and the mayor of Oakland who is a walking disgrace. THE PRESIDENT: The justice department has done a fantastic job. I do think we should have legislation where you put an extra line in the money that we give ’em. “You want the money, you can’t have the sanctuary cities.” That’s why we avoid the court battles all the time, which we probably will win, but who needs it. They want the money? They should give up on the sanctuary cities. It harbors horrible criminals. What the mayor of Oakland did the other day was a disgrace. It’s certainly something that we’re looking at with respect her individually. What she did is incredible — and very dangerous from the standpoint of ICE and Border Patrol. RUSH: Now, if you’re just tuning in, what she did was give the criminal element in Oakland — the illegal-immigrant criminal element — a heads-up that ICE was coming to do a roundup. She essentially went on TV and started shouting, “Five-0!” for a half-hour to let the criminal element know that ICE was coming. They were able to hide a significant number of them, and it is a disgrace, and it is eerily similar. You know, there’s another similarity. I mentioned this yesterday. These people like Governor Brown calling Sessions and Trump “white supremacists,” and the media picks that all up. And it reminds me that they hate Joe McCarthy, ’cause Joe McCarthy found communists everywhere in the government. Finally, one day, somebody said, “Senator, have been have you no shame? Can you not give this up?” Well, you know, we’re at about that stage with this sanctuary city business and this whole Russia investigation. So I see the Democrats becoming what they profess to despise. They’re becoming the equivalent of slave states in the old South and the equivalent of Joe McCarthy on this stupid Russia-collusion business.